Should I create one page per service/product/feature or a single page that lists them all? I was recently asked this question by email, and thought it would be useful to share my reply in a blog post. I can’t really answer the question from the more interesting angle – the psychology and expectations of your potential customers – but I can tell you what the data says; the evidence-based approach. 1. The SEO benefit. The more topic-focused pages you have with unique titles, the better chance you have of attracting organic search traffic. 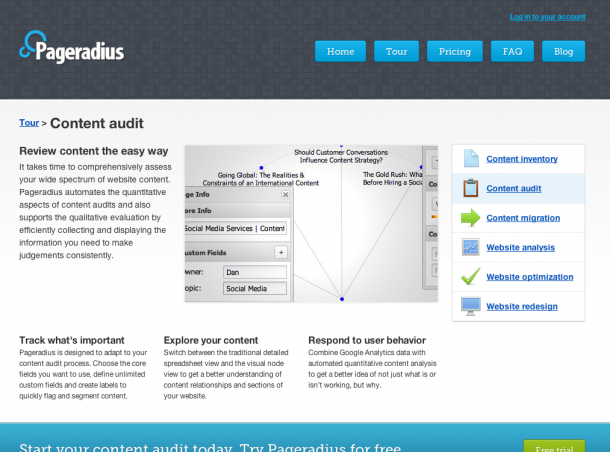 For our upcoming content audit app, Pageradius, I created six small landing pages for SEO-targeted terms. Creating the small amount of copy for these pages took less than a day, and even if they only bring in one or two extra customers via search, they’ll probably pay for themselves. The greatest proportion of time for this kind of task should be dedicated to keyword research – finding the the keywords that you can effectively compete on and that provide enough volume to be worthwhile. It’s a shameless plug, but I talk about my keyword research process in detail in chapter 23 of my new book, A Practical Guide to Web App Success. You should be able to perform the keyword research and write/edit the copy for five or six pages in two to three days… and it’s “evergreen” content (as we say in the content strategy world) that doesn’t need to be updated very often, so it has low ongoing overhead. 2. If you want to grow your business, running targeted adverts (Google AdWords, Facebook Ads) is a good way to gauge relative interest, prioritize the roll-out (where you focus your attention first) and, of course, attract customers. If you have feature/service-specific landing pages for the keywords you’re targeting (“content audit tools”, “web cms migration”), your ad quality score will go up, and therefore your cost per click will go down. In other words, targeted ads pointing to targeted pages will cost you less than targeted ads pointing at a single generic page. Plus you have better expectation-matching for customers who click through, so a better chance of conversion. 3. Probably the biggest reason: all the data I’ve seen points to people being more likely to contact you if they’ve visited multiple pages on your site. Now obviously there’s a bit of a selection-bias here (by visiting the contact page they’ll of course increase their pages-per-visit by one anyway), but the numbers are convincing. On Contentini we have configured conversions in Google Analytics and can easily prove to ourselves that people who contact us have usually visited one of our specific service pages first. 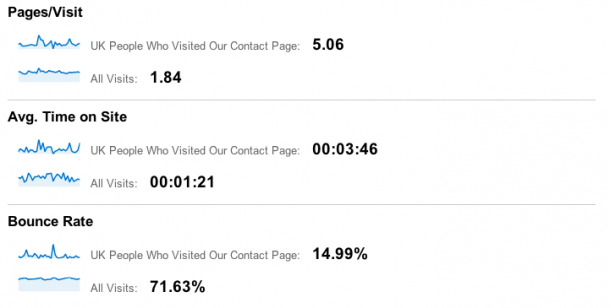 On another website we run (where conversion tracking is tricky because of technical issues), we use advanced segments to compare ‘average’ visitors to those who visit the ‘contact us’ page. You can easily do this retrospectively, if you don’t already. The data clearly shows that potential customers (those who visit the contact page) spend more time on more pages than the average visitor. Very cool, signed up pageradius. Brilliant name, btw. Was actually looking for some advice on microcopy. Maybe Amy can write that book. Soon, too, I hope.